Cold Spring, MN – Third Street Brewhouse is a triple Can Can winner at the 2018 awards, medaling for Minnesota with the delicious brews of Minnesota Gold, Hunny Do and Sanity Break. The Can Can Awards is a beer competition exclusively for canned craft beers, with over 350 beers worldwide submitted and subjected to a blind taste test. The Can Can Awards began in 2016 to showcase canning as a cost-effective, convenient and eco-friendly way to produce, share and enjoy great craft beer. For a craft beer to earn the coveted pop top in gold, silver or bronze, the brew is sampled by a 24-member judging panel. This year’s competition hosted 39 distinct categories including ales, lagers and hybrid styles. Are you thirsty yet? Read on to learn more about each of these Minnesota-brewed champions. Fittingly, Minnesota Gold received a gold medal in the American-Style Lager category. “Minnesota Gold quickly became our flagship beer after its release a few years ago,” noted Karl Schmitz, Brewhouse Manager. This fine brew was first produced by Third Street Brewhouse in 2015 and quickly became the brewery’s number one seller. Minnesota Gold is available for purchase in many Minnesota bars and liquor stores and year-round in 12-packs of 16-ounce-cans. Get a taste of Minnesota Gold for yourself! 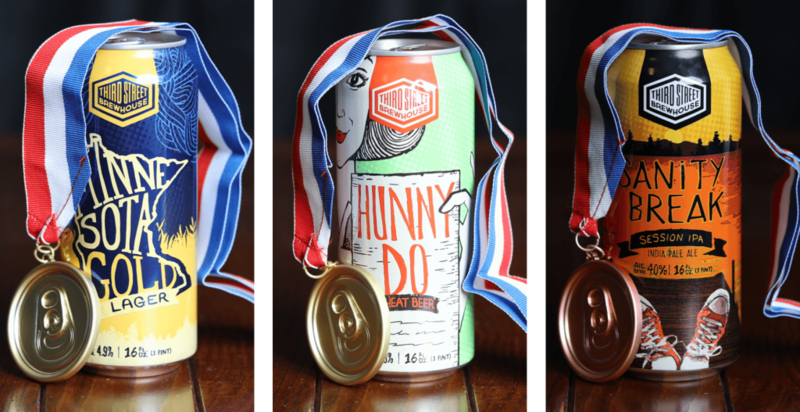 The second gold-medal winner in the American-Style Wheat Beer Category this year is the seasonal brew, Hunny Do. This crisp, sweet melon wheat beer was first brewed in 2013 and can only be found and enjoyed seasonally May to August at a variety of establishments, in 16-ounce-can-8-packs, or as a tasty treat in Third Street Brewhouse’s Summer Variety Pack. Summer is also a great time to find time to sample the fan favorite bronze medal winner of the Session India Pale Ale category, Sanity Break. Sanity Break, first brewed in 2017, is a new year-round favorite with a deep golden color, crisp flavor and lower alcohol content that makes it great for drinking on a summer day, or whenever you’d like a Sanity Break. Check it out on tap or in a convenient 4-pack of 16-ounce-cans. Founded in 1874, Cold Spring Brewing Company has remained a fixture in the little Minnesota town that inspired its name for more than a century. The spring is one of the purest sources of water in North America. There are certain pure elements in the water that are perfect for brewing world-class beers. Today, the company employs over 300 people throughout its state-of-the-art brewery and beverage product development and production facility that includes Third Street Brewhouse and Monarch Custom Beverages. Third Street Brewhouse is a craft beer division of the company, which now acts as the public face of the brewery. Monarch Custom Beverages is a custom beverage product manufacturer and the #1 producer of exclusive beer and craft beer brands for major retailers in the United States and other companies throughout the world. Visit us at www.thirdstreetbrewhouse.com. Third Street’s year-round beers are available at liquor stores, as well as on tap at many bars and restaurants. Fan favorites include our craft staples Minnesota Gold Lager, Sanity Break Session IPA, Hop Lift IPA, Lost Trout Brown Ale and Free Speech Red Ale. They also enjoy seasonal and specialty beers including Sun Seeker Shandy, Hunny Do Wheat Beer and Cool Beans Imperial Coffee Porter. The Can Can Awards is the premier beer competition focused solely on canned craft beers. In their second year, over 350 beers were entered from across the globe, including entries from both large breweries and small breweries alike. The Can Can Awards invites beer industry professionals to blindly sample canned beers submitted from breweries and brewpubs around the world. Each beer submitted is submitted in a specific category. The Judges Panel sips submitted beers in order to award Gold, Silver, and Bronze medals to the three beers that best represent each individual category of beers. Beers are assigned to Judges with specific and applicable experience with the particular category in question. Judges are never able to judge their own products or any products with any relation to them. To learn more about the Can Can Awards, visit https://cancanawards.com.